Narcan And Naloxone Can Be Hard To Get : Shots - Health News The U.S. surgeon general has recommended that naloxone, the opioid overdose reversal drug, be widely available to consumers. But there are several barriers to consumers' ability to acquire it. The Surgeon General recommends more Americans carry naloxone, the opioid overdose antidote. Sturgeon sprayed a dose of the drug up the driver's nose, and waited for it to take effect. About a minute later, she says, the paramedics showed up. "As they were walking towards us, the driver started slowly moving," she says. Both people survived. Sturgeon had the drug with her because she works for Overdose Lifeline, a non-profit devoted to distributing naloxone, but many bystanders would be unprepared to help. Last month, U.S. Surgeon General Jerome Adams issued an advisory urging more Americans to learn to use naloxone, and carry it with them in case they encounter someone who has overdosed. With the increase in overdoses nationwide, the advisory suggests that lay responders — people who may witness an overdose before police or EMS arrive — can play a critical role in saving lives. But if you're not a medical professional, getting a dose of naloxone can be difficult. It is a prescription drug and normally a doctor or nurse would have to directly prescribe it for the person at risk of overdosing. Corey Davis, an attorney for the National Health Law Program, says that creates a barrier for people with addiction. "A lot of people at risk of an overdose don't have contact with a medical provider or they're afraid because of stigma," he says. To broaden access, every state and Washington, D.C., have passed laws making it easier for friends and family members or bystanders to get and use naloxone. Just how easy it is still depends on your state, or even the pharmacy you go to. Davis says most states allow something called third-party prescribing, which lets doctors prescribe naloxone to someone who knows the person at risk of an overdose. And most states have also passed some kind of Good Samaritan law providing legal immunity for people who administer the drug or call 911. Davis says another type of law allows a kind of prescription called a standing order. "But instead of having a person's name on it, it has a group of people," says Davis. A standing order could apply, for example, to anyone who takes opioid painkillers, or suffers from addiction. Or, Davis says, "Anybody who might be in a position to assist someone, which unfortunately, today means essentially everybody." In his home state of Indiana, Jerome Adams signed a statewide standing order in 2016, while serving as the state's health commissioner. It allows pharmacies, local health departments or nonprofits that register with the state and follow certain requirements to dispense the drug to anyone who requests it. Even if you understand the laws regulating naloxone in your state — and you feel comfortable asking for it at the pharmacy counter — there's still the cost, which has gone up in recent years. Two pharmacies near WFYI in Indianapolis, stock naloxone. One charged $80 for two doses of the generic form of the drug. The other charged $95 for two doses of Narcan, the brand-name version. "It's expensive," says Brad Ray, a researcher at Indiana University's School of Public and Environmental Affairs. "People who are users are scraping money together to buy drugs. They're not prepared to buy naloxone with that money." Several U.S. 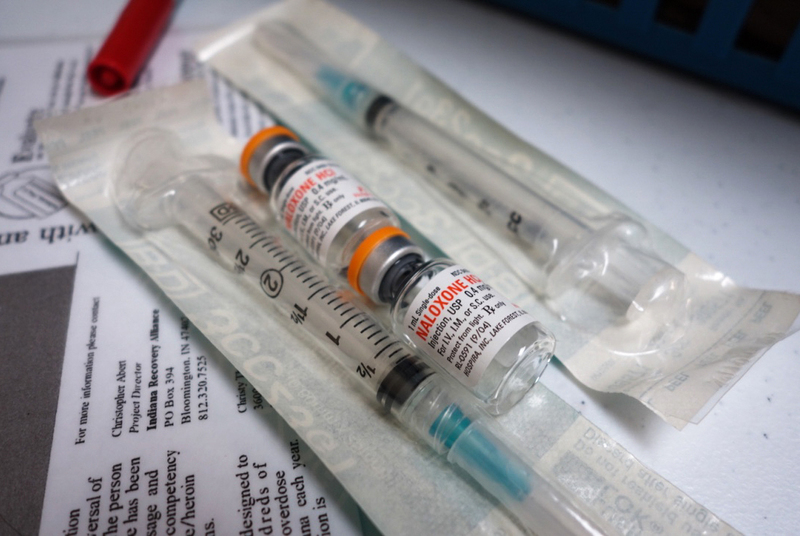 Senators have signed on to a letter urging Health and Human Services Secretary Alex Azar to negotiate with drug companies to lower the price of naloxone. For people who can't afford the drug, Ray says health departments and nonprofits can help. Laws in many states allow these organizations to dispense naloxone to lay responders. Indiana's health department used federal and state funds to purchase nearly 14,000 naloxone kits since 2016, the state reports. The state distributes those free doses through county health departments. But nearly half of Indiana counties didn't request kits. And the majority of the kits went to first responders. Local health departments, Ray says, need to work harder to get naloxone to people who might use it. People who use drugs, after all, may not feel comfortable going to the government for naloxone. "Getting it in the hands of users — that's the trick we need to figure out," Ray says. Corey Davis says there is one change that could really help. The Food and Drug Administration or Congress could make naloxone an over-the-counter medication to make it easier to access, and maybe cheaper. FDA Commissioner Scott Gottlieb has the authority to do so, Davis says, but so far he has not.